Back in 1752, Benjamin Franklin performed an epic — and incredibly dangerous — experiment. In order to show that lightning is a form of electricity, he flew a kite in a thunderstorm with a key attached. 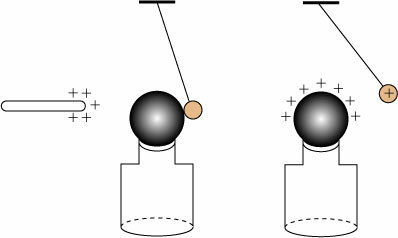 The key drew off electricity from the thunderclouds, and Franklin could feel a shock from the key, thus demonstrating that it had collected static electricity. That’s about the extent of the information I learned about Franklin’s experiment when I was a kid in grade school. I never thought to look any deeper into this groundbreaking achievement, however, until I learned last week that Franklin had been made a Fellow of the Royal Society because of his electrical work. As a Fellow, he would natural be expected to publish in the Philosophical Transactions of the Royal Society, and I quickly confirmed that he had in fact published quite a bit on electricity in the Transactions. It gets even better, though: before being a Fellow, Franklin sent a number of letters describing his experiments to his friend and colleague Peter Collinson, himself a Fellow. One of these is the description of his famous kite flying experiment, published only months after Franklin himself is reputed to have performed it! 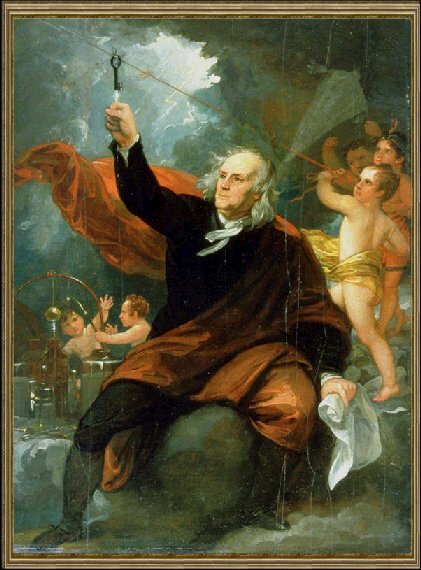 In this post I’ll give an account of Franklin’s work preceding his kite-flying excursion, the full text of the letter itself, and the impact it had on electrical research. It is nearly impossible to find a superlative that isn’t appropriate in describing Benjamin Franklin (1706-1790). He was a scientist, inventor, author, satirist, politician, political theorist, and diplomat, among other things, and wildly successful at all of these roles. In my personal opinion, he would rank among the greatest of American solely for his 1787 speech at the Constitutional Convention, one of the most amazing orations of all time and likely crucial to the acceptance of the U.S. Constitution. 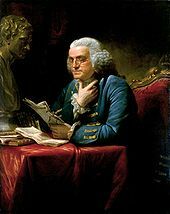 Franklin started his electrical experiments in 1746; now in his 40s, he had already made a significant name for himself. He had been writing Poor Richard’s Almanack since 1733, and in 1728 he had set up a printing house and begun printing the newspaper The Pennsylvania Gazette, providing a platform for editorials about local reform. 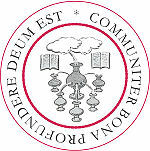 In 1731, Franklin and colleagues founded a subscription library called the Library Company of Philadelphia, and in 1743 he would found the American Philosophical Society as a forum for discussion of scientific ideas; both organizations still exist today. It is through the Library Company that Franklin’s interest in electricity was sparked. The company used subscriptions from its members to purchase books on a wide variety of topics, ranging over history, science and literature; significantly, religious works were a very small fraction of the total. Books were purchased from London through the Quaker merchant and botanist Peter Collinson, who also happened to be a Fellow of the Royal Society. The connection to Collinson seems to be related to his close relationship with the Philadelphia botanist and fellow Quaker, John Bartram, who also was connected to the Library Company. Bartram was instrumental in introducing many varieties of New World plants to Europe through regular shipments of seeds to Collinson, who would then distribute them. These shipments became known as “Bartram boxes”, were shipped every fall to Collinson. Pennsylvania fossils, &c. given by Mr. Bartram. Instruments and utensils of the Eskimaux, given by the North West company. A Snake’s skin, twelve feet long, and sixteen inches over. A Piece of marble, lately dug out of the ruins of Herculaneum. A twelve inch concave reflecting mirrour, given by B.F.
Two manuscripts in rolls, in the Russian language and character, given by Mr. Lewis Timothy. The hand and arm of an Egyptian mummy presented by Mr. Benjamin West. Collinson electrical tube, ca. 1747, from the Frankliniana database. The tube has an open end that can be sealed with cork; rubbing the exterior with a piece of leather allows one to build up charge within the tube that can be transfered to other objects. The process is essentially the same by which a glass rod can be electrically charged by rubbing it with silk — the silk strips electrons off of the rod, leaving the rod positively charged. It would be no small addition to the favour if thou couldst conveniently bring with thee some of the Apparatus as the Glass Tube. Your kind present of an electric tube, with directions for using it, has put several of us on making electrical experiments, in which we have observed some particular phaenomena that we look upon to be new. I shall, therefore communicate them to you in my next, though possibly they may not be new to you, as among the numbers daily employed in those experiments on your side the water, ’tis probable some one or other has hit on the same observations. For my own part, I never was before engaged in any study that so totally engrossed my attention and my time as this has lately done; for what with making experiments when I can be alone, and repeating them to my Friends and Acquaintance, who, from the novelty of the thing, come continually in crouds to see them, I have, during some months past, had little leisure for any thing else. I am, &c.
This letter began a fruitful correspondence in which Franklin would communicate his results to Collinson, who in turn would read them before the Royal Society, leading to their broad dissemination amongst European scientists. Place an Iron Shot of three or four Inches Diameter on the Mouth of a clean dry Glass Bottle. By a fine silken Thread from the Ceiling, right over the Mouth of the Bottle, suspend a small Cork Ball, about the Bigness of a Marble: the Thread of such a Length, as that the Cork Ball may rest against the Side of the Shot. Electrify the Shot, and the Ball will be repelled to the Distance of 4 or 5 Inches, more or less according to the Quantity of Electricity. 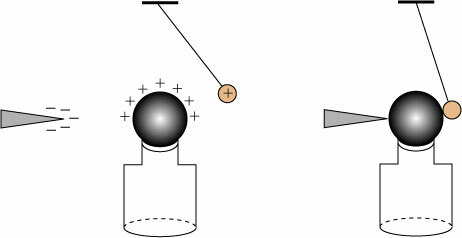 A schematic of the experiment and its interpretation is given below. 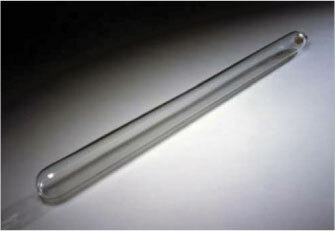 The positively-charged glass tube is brought to the shot, stripping it of some of its free electrons. Being grounded itself on the glass, it becomes positively charged, as does the cork that is pressed against it. The positively-charged cork is repelled from the positively-charged shot and therefore hangs away from it. With a small azimuthal impetus, it could even be made to “orbit” the shot! Experiments like these also led Franklin to label the two types of electrical charge as positive and negative, terminology that is still with us today! That, however, is a topic for another blog post. Electrify the Shot, and the Ball will be repelled to the Distance of 4 or 5 Inches, more or less according to the Quantity of Electricity. When in this State, if you present to the Shot the Point of a long, slender, sharp Bodkin at 6 or 8 Inches Distance, the Repellency is instantly destroy’d, and the Cork flies to it. A blunt Body must be brought within an Inch, and draw a Spark to produce the same Effect. To prove that the Electrical Fire is drawn off by the Point: if you take the Blade of the Bodkin out of the wooden Handle, and fix it in a Stick of Sealing Wax, and then present it at the Distance aforesaid no such Effect follows; but slide one Finger along the Wax till you touch the Blade, and the Ball flies to the Shot immediately. If you present the Point in the Dark, you will see, sometimes at a Foot Distance and more, a Light gather upon it like that of a Fire-Fly or Glow-Worm; the less sharp the Point, the nearer you must bring it to observe this Light: and at whatever Distance you see the Light, you may draw off the Electrical Fire, and destroy the Repellency. If a Cork Ball, so suspended, be repelled by the Tube, and a Point be presented quick to it, tho’ at a considerable Distance, tis surprizing to see how suddenly it flies back to the Tube. Points of Wood do as well as those of metal, provided the Wood is not dry. This idea — that sharp metal points may draw off the “electrical fire” (and also impart it) suggested to Franklin a practical application for his researches. Around 1749, he had sent a paper to Collinson titled, “Observations and suppositions, towards forming a New hypothesis for explaining the formation of Thunder-gusts,” in which he laid out an electrical theory of thunderstorms and argued that lightning is a form of electricity. This was not exactly a novel suggestion, as the similarity between the phenomena was almost undeniable. However, the world of difference in magnitude between a tube-generated static shock and a murderous lightning bolt was difficult to reconcile in that era. As I have noted in another post, even 80 years later Michael Faraday still felt justified in showing that various forms of electrical phenomena — static, chemical, animal — were the same. I was very much pleased with some ingenious papers in the late Transactions on the subject of electricity. There is something however in the experiments of points, sending off, or drawing on, the electrical fire, which has not been fully explained, and which I intend to supply in my next. For the doctrine of points is very curious, and the effects of them truly wonderfull; and, from what I have observed on experiments, I am of opinion, that houses, ships, and even towns and churches may be effectually secured from the stroke of lightening by their means; for if, instead of the round balls of wood or metal, which are commonly placed on the tops of the weathercocks, vanes or spindles of churches, spires or masts, there should be put a rod of iron 8 or 10 feet in length, sharpen’d gradually to a point like a needle, and gilt to prevent rusting, or divided into a number of points, which would be better-the electrical fire would, I think be drawn out of a cloud silently, before it could come near enough to strike; only a light would be seen at the point, like the sailors corpusante. This may seem whimsical, but let it pass for the present, until I send the experiments at large. Here we have one of the first descriptions of what we now refer to as a lightning rod! It is to be noted, however, that Franklin’s description of the usefulness of a lightning rod is completely at odds with their actual utility. Franklin imagined that a lightning rod would dissipate the electricity before it would strike; an actual lightning rod provides a “path of least resistance” for lightning that allows it to be directed to the ground without going through a building. If a tube of only ten feet long will strike and discharge its fire on the punch at two or three inches distance, an electrified cloud of perhaps 10,000 acres may strike and discharge on the earth at a proportionally greater distance. The horizontal motion of the scales over the floor, may represent the motion of the clouds over the earth; and the erect iron punch, a hill or high building; and then we see how electrified clouds passing over hills or high buildings at too great a height to strike, may be attracted lower till within their striking distance. And lastly, if a needle fixed on the punch with its point upright, or even on the floor below the punch, will draw the fire from the scale silently at a much greater than the striking distance, and so prevent its descending towards the punch; or if in its course it would have come nigh enough to strike, yet being first deprived of its fire it cannot, and the punch is thereby secured from the stroke; I say, if these things are so, may not the knowledge of this power of points be of use to mankind, in preserving houses, churches, ships, &c. from the stroke of lightning, by directing us to fix on the highest parts of those edifices, upright rods of iron made sharp as a needle, and gilt to prevent rusting, and from the foot of those rods a wire down the outside of the building into the ground, or down round one of the shrouds of a ship, and down her side till it reaches the water? Would not these pointed rods probably draw the electrical fire silently out of a cloud before it came nigh enough to strike, and thereby secure us from that most sudden and terrible mischief? To determine the question, whether the clouds that contain lightning are electrified or not, I would propose an experiment to be tried where it may be done conveniently. On the top of some high tower or steeple, place a kind of centry-box big enough to contain a man and an electrical stand. From the middle of the stand let an iron rod rise and pass bending out of the door, and then upright 20 or 30 feet, pointed very sharp at the end. If the electrical stand be kept clean and dry, a man standing on it, when such clouds are passing low, might be electrified and afford sparks, the rod drawing fire to him from a cloud. If any danger to the man should be apprehended (though I think there would be none) let him stand on the floor of his box, and now and then bring near to the rod the loop of a wire, that has one end fastened to the leads, he holding it by a wax handle; so the sparks, if the rod is electrified, will strike from the rod to the wire, and not affect him. The Philadelphian experiments, that Mr. Collinson, a member of the Royal Society, was so kind as to communicate to the public, having been universally admired in France, the king desired to see them performed. Wherefore the duke d’Ayen offered his majesty his country-house at St. Germain, where M. de Lor, professor of experimental philosophy, should put those of Philadelphia in execution. His majesty saw them with great satisfaction, and greatly applauded Messieurs Franklin and Collinson. These applauses of his majesty having excited in Messieurs de Buffon, d’Alibard, and de Lor, a desire of verifying the conjectures of Mr. Franklin, upon the analogy of thunder and electricity, they prepared themselves for making the experiment. M. d’Alibard chose for this purpose a garden situated at Marly, where he placed upon an electrical body a pointed bar of iron, of forty feet high. 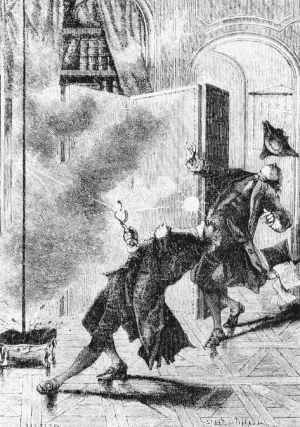 On the 10th of May, twenty minutes past two in the afternoon, a stormy cloud having passed over the place where the bar stood, those that were appointed to observe it, drew near, and attracted from it sparks of fire, perceiving the same kind of commotions as in the common electrical experiments. M. de Lor, sensible of the good success of this experiment, resolved to repeat it at his house in the Estrapade, at Paris. He raised a bar of iron ninety-nine feet high, placed upon a cake of rosin, two feet square, and three inches thick. On the 18th of May, between four and five in the afternoon, a stormy cloud having passed over the bar, where it remained half an hour, he drew sparks from the bar, like those from the gun barrel, when in the electrical experiments, the globe is only rubbed by the cushion, and they produced the same noise, the same fire, and the same crackling. They drew the strongest sparks at the distance of nine lines, while the rain, mingled with a little hail, fell from the cloud, without either thunder or lightning; this cloud being, according to all appearance, only the consequence of a storm, which happened elsewhere. “Benjamin Franklin Drawing Electricity from the Sky” by Benjamin West (1738-1820) (source). All Europe is in Agitation on Verifying Electrical Experiments on points. All commends the Thought of the Inventor. More I dare not Saye least I offend Chast Ears. The Doctor, having published his method of verifying his hypothesis concerning the sameness of electricity with the matter of lightning, was waiting for the erection of a spire [on Christ Church] in Philadelphia to carry his views into execution; not imagining that a pointed rod of a moderate height could answer the purpose; when it occurred to him that by means of a common kite he could have better access to the regions of thunder than by any spire whatever. As frequent Mention is made in the News Papers from Europe, of the Success of the Philadelphia Experiment for drawing the Electric Fire from Clouds by Means of pointed Rods of Iron erected on high Buildings, &c. it may be agreeable to the Curious to be inform’d, that the same Experiment has succeeded in Philadelphia, tho’ made in a different and more easy Manner, which any one may try, as follows. Make a small Cross of two light Strips of Cedar, the Arms so long as to reach to the four Corners of a large thin Silk Handkerchief when extended; tie the Corners of the Handkerchief to the Extremities of the Cross, so you have the Body of a Kite; which being properly accommodated with a Tail, Loop and String, will rise in the Air, like those made of Paper; but this being of Silk is fitter to bear the Wet and Wind of a Thunder Gust without tearing. To the Top of the upright Stick of the Cross is to be fixed a very sharp pointed Wire, rising a Foot or more above the Wood. To the End of the Twine, next the Hand, is to be tied a silk Ribbon, and where the Twine and the silk join, a Key may be fastened. This Kite is to be raised when a Thunder Gust appears to be coming on, and the Person who holds the String must stand within a Door, or Window, or under some Cover, so that the Silk Ribbon may not be wet; and Care must be taken that the Twine does not touch the Frame of the Door or Window. As soon as any of the Thunder Clouds come over the Kite, the pointed Wire will draw the Electric Fire from them, and the Kite, with all the Twine, will be electrified, and the loose Filaments of the Twine will stand out every Way, and be attracted by an approaching Finger. And when the Rain has wet the Kite and Twine, so that it can conduct the Electric Fire freely, you will find it stream out plentifully from the Key on the Approach of your Knuckle. At this Key the Phial may be charg’d; and from Electric Fire thus obtain’d, Spirits may be kindled, and all the other Electric Experiments be perform’d, which are usually done by the Help of a rubbed Glass Globe or Tube; and thereby the Sameness of the Electric Matter with that of Lightning compleatly demonstrated. It is important to note that, contrary to popular impressions, Franklin did not want to draw a lightning strike down upon himself! The goal was to draw the “electrical fire” down in a safe way to demonstrate its electrical properties, which he evidently succeeded at. I was pleased to hear of the success of my experiments in France, and that they there begin to erect points upon their buildings. We had before placed them upon our academy and state-house spires. Franklin’s experiment is one of the most fascinating of history, and seems perfectly suited to his character — ingenious, frugal, whimsical, and not a little crazy! Though the kite experiment itself wasn’t the first demonstration of the identification of lightning as electricity, it grew out of his genuinely groundbreaking electrical research and experimental ideas. Franklin’s work was highly influential both in the research of electricity and applications related to it. Franklin himself earned the Copley Medal from the Royal Society in 1753 in recognition of this work, and was made a Fellow himself in 1756. It is somewhat ironic to note that, because of his popularity, Franklin seems to have become a center of correspondence on electricity-related research — where Franklin once was sending letters to Collinson for introduction to the Society, he now was introducing letters himself to the Society from others! Not everyone benefited from Franklin’s ideas. German physicist Georg Wilhelm Richmann was killed on August 6, 1753 in St. Petersburg “while trying to quantify the response of an insulated rod to a nearby storm.” It is said that Richmann was actually slain by ball lightning that traveled along the experimental apparatus. 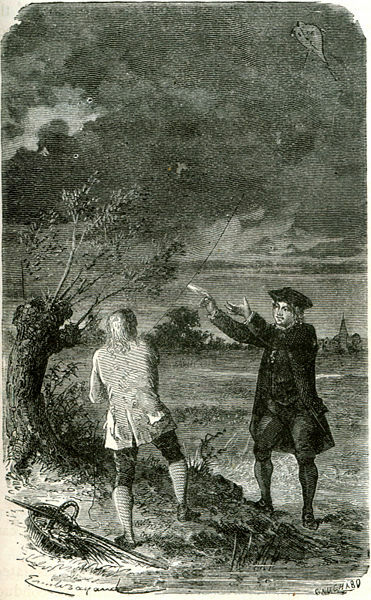 Engraving of the death of Richmann (source). There’s much more to be said about Franklin’s electrical work, which is a wealth of intriguing ideas — I’ll discuss more of it in future posts! The episode of the kite, so firm and fixed in legend, turns out to be dim and mystifying in fact. Franklin himself never wrote the story of the most dramatic of his experiments. All that is known about what he did on that famous day, of no known date, comes from Joseph Priestley’s account, published fifteen years afterwards but read in manuscript by Franklin, who must have given Priestley the precise, familiar details. Franklin’s experiment was not written up until Joseph Priestley’s 1767 History and Present Status of Electricity. Certain details of the experiment — such as the presence of Franklin’s son — were not included in the original letter, but all of the pertinent details were. Exacerbating the situation is a book published in 2003 that argues that the entire kite story was a hoax perpetrated by Franklin on the scientific community! This seems like quite a stretch, and at least in part seems based on the incorrect notion that Franklin never stated explicitly that he actually flew the kite in a thunderstorm. As we have seen, his letter is pretty unambiguous about his actions. Regardless of other shenanigans Franklin had perpetrated in print, he was clearly good friends with the scientists such as Collinson that he corresponded with, and took his electrical work seriously. I personally find it hard to believe that he would violate their trust and the spirit of his work to make some sort of obscure political point. A brilliant post Dr SkySkull! I shall write a longer comment this evening when I have more time. Thanks! I’ll be interested to hear what you have to say. i love that you’re quoting the original letters you dug up. it’s a refreshing change from pretty most blog and magazine articles I read, where it’s clear the information doesn’t go much deeper than wikipedia or a standard textbook. i love that you’re quoting the original letters you dug up. I’m surprised that you weren’t aware of Franklin’s status as a scientist. As well as being a member of the Royal Society he was also a member of two smaller but important scientific societies or scientific discussion groups in England in the 18th century. Firstly the London based Club of Honest Whigs (The Whigs were the English liberal political party) who set Joseph Priestley off on his scientific career and secondly the Lunar Society of Birmingham also known as the Lunatics, because they met once a month at full moon. The later included both of Charles Darwin’s grandfathers Josiah Wedgwood and Erasmus Darwin as well as Joseph Priestley and Matthew Boulton and James Watt who powered the Industrial Revolution with their improved steam engine. Franklin introduced his friend William Small, who had been professor of natural philosophy at William and Mary College in Connecticut and Thomas Jefferson’s teacher, to Matthew Boulton and Small became Boulton’s physician. It was Small who founded the Lunatics and Small who introduced Watt, a fellow Scot, to Boulton. Franklin is a major networker in 18th century science. I. B. Cohen who is justifiably regarded as one of the greatest 20th century historians of science wrote his first major book about Franklin, Benjamin Franklin: His Contribution to the American Tradition, 1953 and his second, which is regarded as a classic, about Newton and Franklin, Franklin and Newton: An Inquiry into Speculative Newtonian Experimental Science and Franklin’s Work in Electricity as an Example thereof, 1956. John Heilbron, another of the HOS giants, wrote a Electricity in the 17th and 18th centuries a study of early modern physics, 1979 which contains substantial material on Franklin. The nicest story I know concerning the lightning conductor is how its form became a political issue. In the electrical community of the 18th century a discussion broke out as to whether a lightning conductor with a round or ball shaped end or one with a pointed or spear shaped end better attracted lightning. Franklin, who took a lively part in this debate, favoured pointed ones. When the American Revolution (War of Independence or Colonial Uprising, pick your term according to you historical standpoint) broke out Franklin, of course, became persona non grata in Britain and the shape of ones lightning conductor became a matter of national allegiance. Supporters of King and Country mounted round-ended conductors on their buildings, as did the King himself on Buckingham Palace. Those with pointed conductors were suspected of being disloyal. Round or pointed that is the question? I’m surprised that you weren’t aware of Franklin’s status as a scientist. 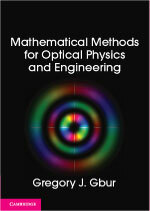 Thanks for mentioning the round vs. pointed debate! I had come across oblique references to the story while researching my post, but didn’t have the time to confirm it for my post (and the post was getting dangerously long, already). Now that you’ve confirmed it for me, I made it a #weirdscifacts! Somewhere I have a serious paper on the round vs pointed debate but don’t ask me where. If I can find it I’ll let you know. What do they teach in schools these days? I have never considered grade school in the US to be much more than a glorified day care. However I thought it was well know that Franklin was as a Renaissance man with great intelligence and wide ranging interests. 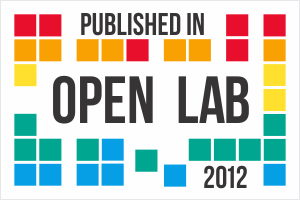 Less scientific but interesting is this collection of letters. You will see that the Franklin letter to Collinson, as published by the Royal Society, does not contain a statement that Franklin himself had carried out the experiment. What he says is: “it may be agreeable to the Curious to be inform’d, that the same Experiment has succeeded in Philadelphia”. Putting on my sceptical hat, my feeling is that it would need a very large handkerchief indeed to get a kite – weighted with the metal wires described – to fly successfully to any height: though again, if one reads the letter carefully, what it says is that “As soon as any of the Thunder Clouds come over the Kite, the pointed Wire will draw the Electric Fire from them”. He doesn’t say the experimenter flew the kite into the clouds: merely that the clouds came “over” it.